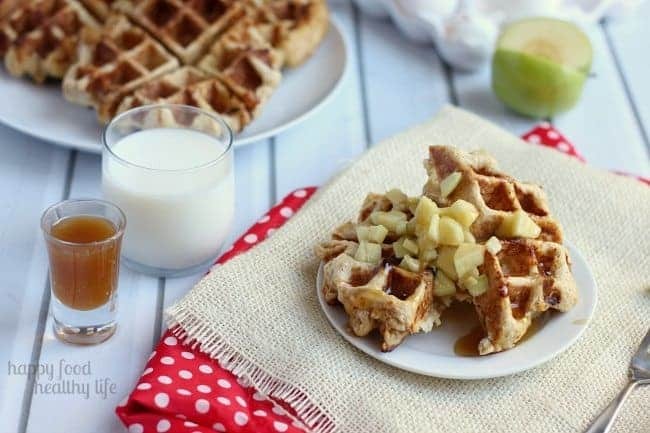 These CARAMEL APPLE STUFFED WAFFLES are a deliciously decadent treat for an Autumn breakfast or special occasion. Every bite lends way to a caramel apple, one of our favorite fall indulgences. Yes, it is technically still summer. Yes, there are still peaches, pears, and zucchini to be consumed. But oh.my.goodness, the caramel apple recipes that I’m seeing all around me are just making me go crazy-anxious for fall-baking. To be honest, pumpkin isn’t even my numero uno for fall baking. it’s all about the apples. And the more caramel on top of those apples the better. So yeah, I tried to hold out until the first day of fall. But the truth of the matter is that I made this masterpiece over a month ago. It has taken quite a bit of restraint just to wait this long! So today, we’re digging in. Face first. Mouth open wide. Fork and knife in hand. Napkin tucked into our shirts. We’re going in prepared. So let’s talk about these. Earlier in the year, I stuffed waffles with eggs, spinach, cheese, avocado, and veggie-sausage. I was in love. But ever since then, I just knew I had to create a sweet version of my stuffed waffle. Now, the difference between the normal stuffed waffle that you see all over the internet is that my stuffed waffles are literally STUFFED. It’s not a waffle sandwich where the waffle plays the role of the bread. It’s when you take the Belgium waffle dough, place the filling on top, and then place another mound of waffle dough on top of that and squish it all together in your iron. Now THAT’s how you create a stuffed waffle. 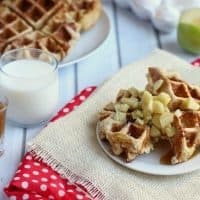 That way, all your fillings are literally mashed up in every single bite of your waffle! I see a lot of WIN in this situation. Speaking of situations, I’m really curious what your weekend breakfast situation looks like. Do you cook a big breakfast on the weekend? Does everyone fend for themselves? Do you have friends over? Or maybe breakfast on the weekend is just like any other breakfast. Either way, I want to know. I love making a big breakfast for my wife and son on Sundays. Even if it’s only the three of us. It’s still fun, and it makes it special. The only thing is that it doesn’t normally occur until at least noon on Sundays. By the time I roll out of bed, get coffee brewed, and relax for a little while, the day is half over. Which really is perfect – then I only have to cook two meals those days! 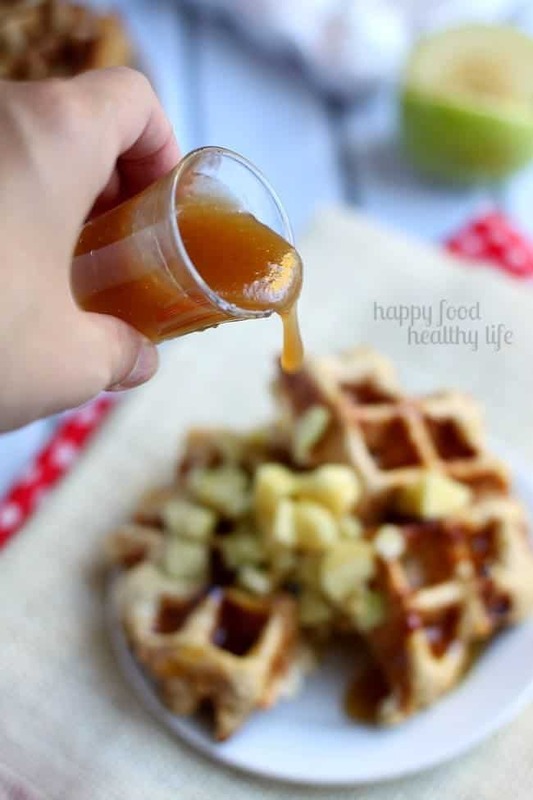 And believe me… if I’m only going to eat one or two things during the day, these CARAMEL APPLE STUFFED WAFFLES would definitely be at the top of my list. Gently stir in the raw sugar. Prepare the filling: Melt the butter in a saucepan. Stir in flour to form a paste. Add water, white sugar and brown sugar, and bring to a boil. Reduce temperature and let simmer. Stretch the ball of dough out a bit and place it on the waffle iron so it covers the majority of it. Quickly place about a large spoonful or two of apple filling in the middle of the dough. Top with a second ball of stretched out waffle dough. To serve, top with a spoonful of apple filling and a drizzle of caramel sauce. If you're really in the mood for dessert, add a scoop of vanilla ice cream on top! Mmm these look amazing!!! 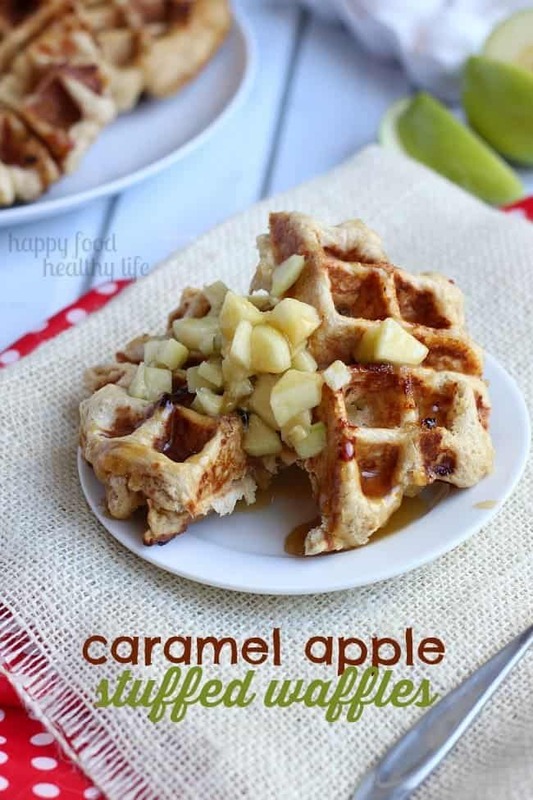 Love the caramel apple flavors and in a waffle..sounds so good! caramel and apple are my favorite for the fall. Thanks for coming by! This looks like the perfect indulgent fall breakfast! Yes, it’s definitely not an every day sort of thing, but for a special occasion, it’s aMAZing!! 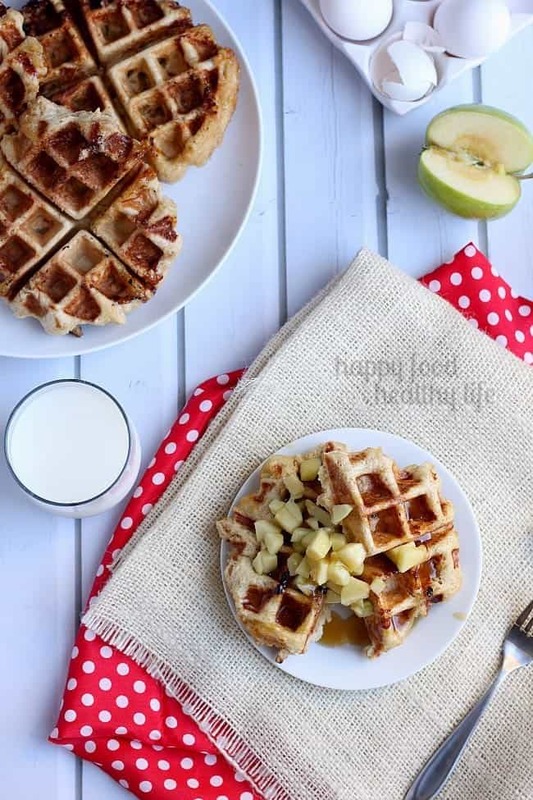 (who looooves apples) works 6 days a week, so big Sunday breakfasts are important family time, I pinned this recipe for next week! Thanks! I bet your husband is going to LOVE this one! Sure it takes a little extra time, but I promise you that it’s worth it! Ohmygoodness – these look SO delicious!!! Can’t wait to use this in my breakfast round up, thank you for sharing! They’re totally amazing! Thanks for using them in your roundup!